Associated Students of the University of the Pacific (ASuop) look at hosting a variety of campus event aimed towards meeting student interests/needs as well as facilitating campus spirit. 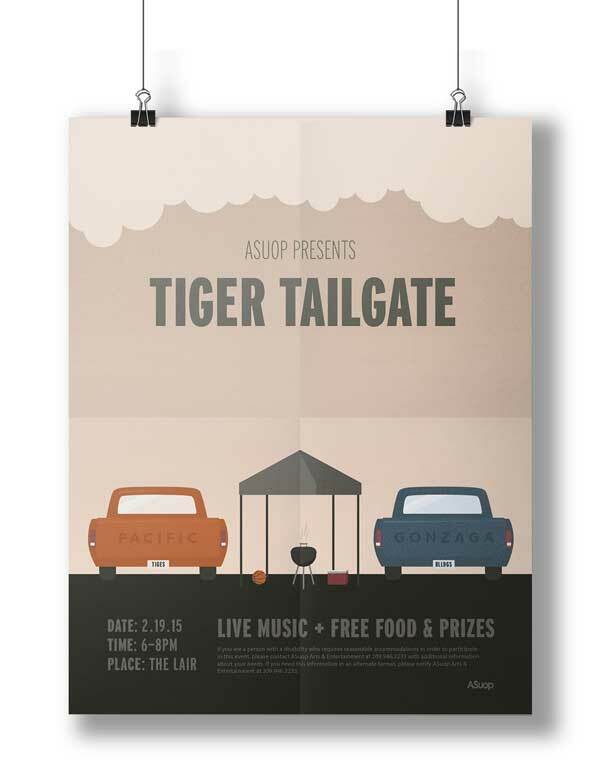 Tiger Tailgate was an event aimed towards the latter as ASuop decided to host a tailgate prior to a highly publicized and nationally aired basketball game. In working with ASuop, I was given a bit more creative freedom. I began with several sketches that emphasized the tailgating aspect of the event. The inspirational posters and imagery displayed represent the illustrative style, color and type that inspired me, or matched the directions and palettes I’d already chosen. With regards to color, I curated a subdued color palette that tied into the event by using a variance of each university’s colors. The oranges represented Pacific, our university and our team, while the blues represented that of Gonzaga. Illustratively, I envisioned drawing on the tailgates of older pickup trucks, as they had a friendly rounded and more romanticized vibe to them. In my illustrations I played on color and type to subtly tie in the basketball competitors. I drew an orange truck to represent Pacific and wrote “Tiges” on the license plate and Pacific on the tailgate, emphasizing both our University and our mascot. I treated the second truck in the same way for Gonzaga. Typographically I used a compressed Interstate. I drew on one of my inspiration posters in how I decided to address type on the top of my poster but went ahead and organized the bottom text to suit my clients needs.